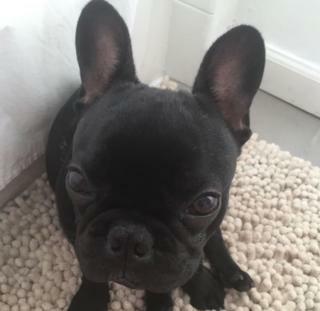 The French bulldog named Kokito died during a flight from Houston to New York on Monday. Eleven-year old Sophie Ceballos, who got the dog for her birthday, said Kokito barked during the flight and that "there was a lot of turbulence". "My mom was like, 'It's a dog, it's a dog,'" the girl told NBC New York. "And [the flight attendant] said, 'You have to put it up there.'" "We assume full responsibility for this tragedy and express our deepest condolences to the family and are committed to supporting them," the US airline said in a statement. "We are thoroughly investigating what occurred to prevent this from ever happening again. Pets should never be placed in the overhead bin," the statement added. In an interview with the girl's mother, Catelina Robledo, she explained she was not able to get up to help the dog, because she was holding a newborn baby in her lap during the turbulence. "The dog barked and barked but I could not stand," Ms Robledo said in Spanish to Telemundo, adding that the flight was more than four hours long. "I witnessed a United flight attendant instruct a woman to put her dog carrier with live dog in an overhead bin," she told One Mile at a Time, a travel website. "The passenger adamantly pushed back, sharing verbally that her dog was in the bag. "The flight attendant continued to ask the passenger to do it, and she eventually complied. "By the end of the flight, the dog was dead. The woman was crying in the airplane aisle on the floor." The eyewitness went on Twitter, saying that "my heart is broken". Although, overhead lockers are not air-tight, lack of oxygen is seen as a possible cause of the dog's death. United's policy for onboard animals states that "a pet travelling in cabin must be carried in an approved hard-sided or soft-sided kennel. "The kennel must fit completely under the seat in front of the customer and remain there at all times." This is not the first time that United Airlines has found itself in a public relations nightmare. In April 2017 a US doctor was dragged off a plane in Chicago after he refused to be "bumped" from his seat. Passenger David Dao, who had emigrated to the US from Vietnam, suffered a concussion and several broken teeth. His daughter said he found the ordeal to be worse than his experience fleeing from Saigon during the Vietnam War.